Barefoot Baby Steps: Why aren't YOU blogging?? When people are passionate about, or at least very interested in, a topic...they talk about it, sometimes to anyone who will listen...that's blogging in a nutshell. 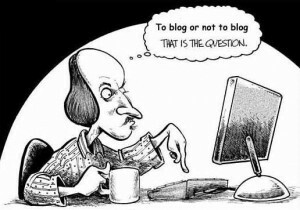 For the undecided, I think blogging is a great experience. It makes you think, collect those thoughts and share them in a (at least we hope) somewhat interesting way. Yes, it would be a greater experience if more people actually read my blog...but I'm documenting a personal running journey and am not really comfortable promoting that (which may have more to do with me being a New Englander than anything else). But still, it would be amazing to hear from a stranger who said, "your post on [fill in the blank] spoke to me and I started running today..."
So, what is it that you are excited about doing? Or learning? Or discovering? Or teaching? Or pondering? Whatever that "thing" is, consider blogging about it...just like 31 million or so other people in America (mostly using Wordpress by the way). More stats can be found in this great infographic on 2012 Blogging Statistics from Blogging.org. Of course, blog in a safe way...no addresses, specifics about future travel or currently being out of town, pics/details about your children (or you if you're in the Witness Protection Program or have similar security concerns!). A good rule of thumb is don't discuss anything you wouldn't share with a stranger, and another is don't talk trash about people in your life. You may not use your real name on your blog, but if it is linked to any other social media accounts...someone can find out who and where you are.